Click and drag the widget / button on the left of your screen to the white space and type a title. 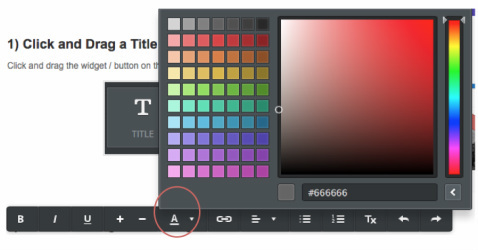 If you want to change the colour of your text, click on the arrow to the right of the capital A. Bring up the font editing bar by highlighting some of the text. Click and drag the image widget / button on the left of your screen to the white space. Click in the box where it says "upload image". Select "search" and type in the picture you want in the box titled "search for images"
A note on copyright: Do not use any images unless you have taken them or drawn them yourself or unless you have checked that they are copyright free or licences under creative commons. All the images you search for using this site should be free from Flkr website so you are okay to use them, but there may be limited selection. 4) Adding a web link allows you to link interesting content to your website so you can share with others some interesting things that you've found. You might want to add a video that your classmates are uploading to YOUTUBE. You might have seen an interesting video or website. Copy the WEB ADDRESS of the webpage or video that you like. Click and drag the BUTTON link into the white space. Hover your mouse over the words "Button Text" then click so you get a pop up box. Next click on the LINK in the top right. Another pop-up box will appear and you paste the WEB ADDRESS here in the slot titled "Website URL". Now you have a quick way of showing your reader where your ideas came from and you can share your thoughts with them in this way. Go to the last third of this video to see images of many people who have been wrongfully imprisoned in the U.S.